You cannot smoke here (which is a relief for the silently suffering non-smokers) but can enjoy good food and wine. This is an ideal venue for all kinds of parties, being business or family celebrations. 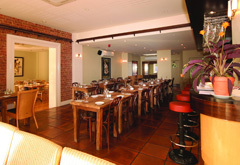 Bar 191 operates a wine club that feature�s a wine tasting and dining event as well as the opportunity to buy wines not always available to the public. Each event feature�s wines of a particular grape variety or region and will be a fun and social way to learn more about wine. In addition to the wines listed on the menu, the restaurant offers a range of premium wines for special occasions or for the connoisseur. The cuisine is Mediterranean as historically tapas is drawn from Roman, Greek, Arab & Moorish infuences. We make all our tapas fresh and try to source produce locally if possible.